Our 5 Conversations programme draws on over 30 years of insight and experience working with global leaders and managers. We know exactly what conversations to have to drive better engagement and build trust across your business. Delivered by The Oxford Group's expert facilitators, 5 Conversations helps managers and leaders have better discussions with their teams, colleagues and stakeholders, whether that's in day to day work or during performance management meetings. One of the first workshops that I have attended which I found very useful and applicable in work and real life. Benson Smith, Chairman, President & CEO, Teleflex Inc.
We can bring 5 Conversations into your business in a format that works for you. One day face-to-face workshop - Run by two facilitators from The Oxford Group for up to 20 participants. Virtual bite-size - Run by one facilitator from The Oxford Group for up to 10 participants. Learning is delivered in five separate two-hour virtual sessions. Licensed - Our expert facilitators will train your internal trainers who, once accredited, will be able to deliver 5 Conversations face-to-face or virtually for you in-house. 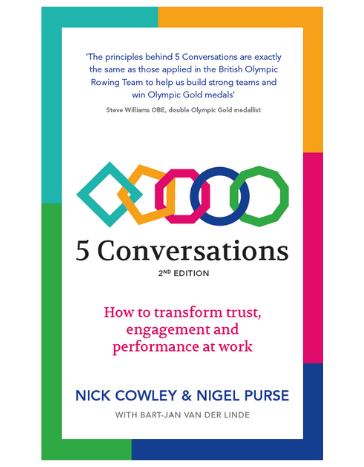 The 2nd edition of 5 Conversations: How to transform trust, engagement and performance at work is out now. Described as "highly readable, practical and relevant for public and private sectors alike", the new edition includes updated neuroscience research, how the 5 Conversations link to psychological safety at work, enhanced case study content and new employee engagement data. The saying goes 'you come into the world alone, you leave this world alone', but in between, 5 Conversations can help you build great relationships in work and life.